Colorful, beautiful, bright, shimmering- when people think of the order Lepidoptera which consists of moths, skippers, and specifically, butterflies, these kinds of adjectives usually come to mind. However, as I learned on my trip last weekend to Big Thicket National Preserve, butterflies have a much greater diversity of appearances than many people might expect. The purpose of the trip with my classmates was to participate in a bioblitz where we sampled the diversity of Lepidoptera in the area. Big Thicket is a beautiful wooded area in southeast Texas that was designated one of the first national preserves in America partly due to its immense biodiversity. Sounds like a great place to find a great diversity of Lepidoptera, right? 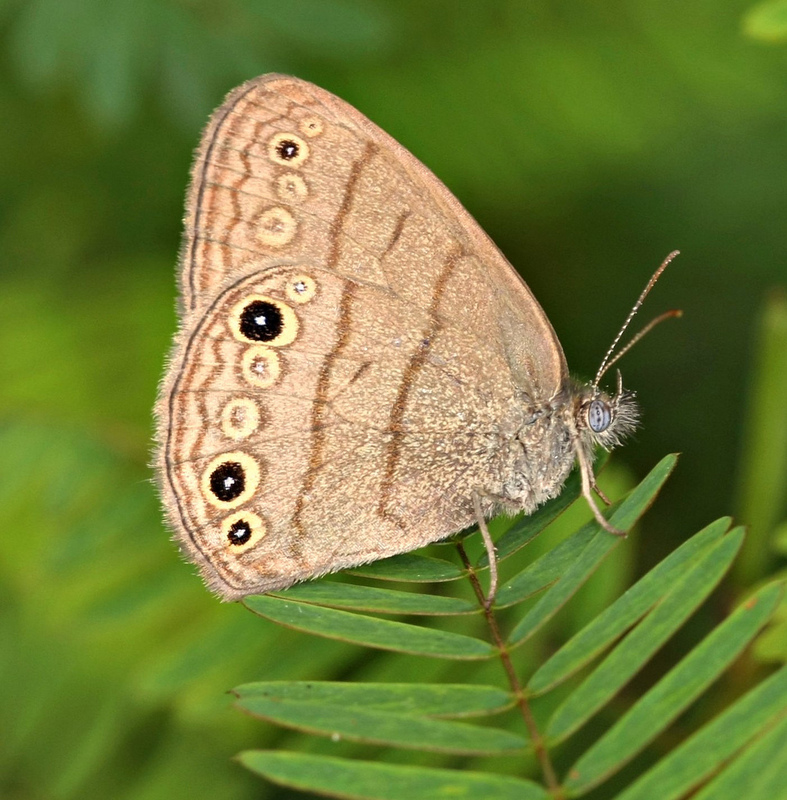 Unfortunately, most Lepidoptera do not frequent heavily forested areas and instead prefer grassy open habitats. It was therefore with some level of trepidation that my team and I trekked out to a few possible sampling sites. Surprisingly, at the very first site in a grassy clearing near the parking lot, we caught seven Carolina satyrs in ten minutes! The small, dull brown butterflies hardly looked like the ideal big colorful butterflies, but we were excited to successfully sample a few. On a previous trip, we had observed barely any Lepidoptera at all, so to us, these tiny plain insects looked like treasures. Since we knew that Carolina satyrs and many other Lepidoptera primarily eat tree sap and rotten fruit, we also set up a bait trap that contained rotten bananas fermented with yeast and sugar. Invigorated by our small success, we set out to our next site. Our next few sites turned out to be even more fruitful, and happily, we were able to collect many small moths and skippers. Like the Carolina satyr, most were fairly dull, ranged in color from white to grey, and were quite small with some wingspans around a centimeter long. However, we were only able to capture another species of butterfly at our last site at the very edge of the Big Thicket. 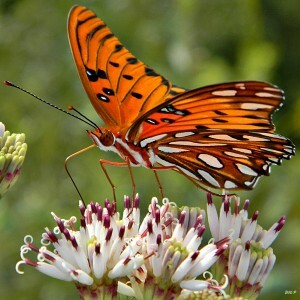 As you might expect, we caught a Gulf fritillary near a patch of flowers. 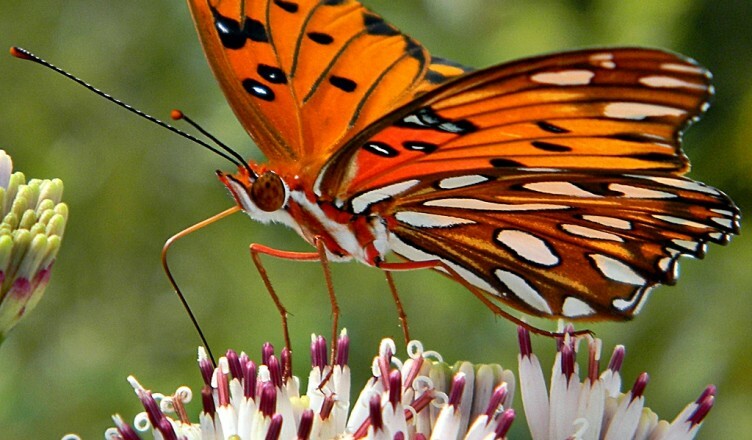 The Gulf fritillary is a medium sized butterfly with beautiful orange wings that have silver patches on their undersides and tend to feed primarily on nectar from flowers. In other words, the Carolina satyr’s direct opposite. Afterwards, I marveled at the differences between the two species. Although they both live in Big Thicket, their habitats are totally different which likely influenced their contrasting appearances. On one hand, Gulf fritillaries (aka the passion butterfly) frequent flowers and their larvae feast on poisonous passion flower vines. The larvae and adults’ bright orange color appears to advertize their poisonous nature to any predators. Indeed, their only dull moment is when the pupa forms which is a dry brown that looks like a dead leaf. On the other hand, Carolina satyrs typically live in the forest understory and their larvae feed on a variety of harmless vegetation. Their dull coloring is likely meant to help them camouflage into the scenery and avoid predators. While the Gulf fritillary and the Carolina satyr have very different strategies for survival, their prevalence in their habitats can attest to their success. Their differences have inspired my hope that in the future, I will sample a much more diverse number of butterflies. I’m sure my future collection would be described as bold in some areas, colorful sometimes, often dull, and frequently plain. Such a description would be a true success. Sexual Cannibalism: The Ultimate Investment in your Child’s Future? ?